Over at Mysterious we’re working on a line of new products. The first we’d like to introduce is the Vorpal Umbrella. The Vorpal Umbrella features an alchemy pattern interior print, skull head handle, and black cloth exterior. The umbrella mechanism is automatic – open and close with a single button press. 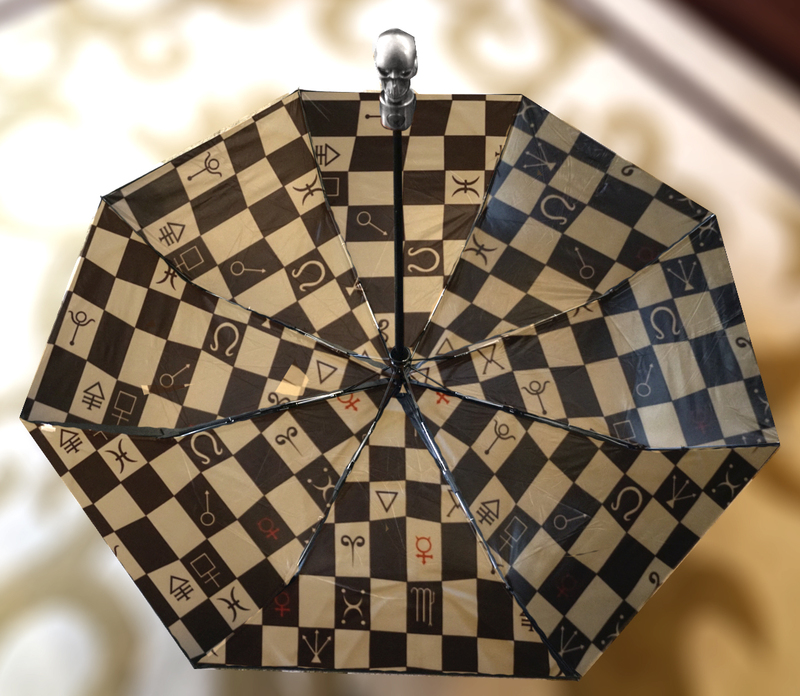 You can sign up to be notified when the Vorpal Umbrella goes on sale by visiting the Mysterious Store. You can also enter to win a FREE Vorpal Umbrella by simply writing to tell us what you like about its design. Is there anything you’d like to see changed or added? Write a brief outline of your thoughts in the comments and you may win a free Vorpal Umbrella! I love the subtlety of it and the unique inner and outer design – lets you show off your own personal flair to what is normally a fairly standard tool everyone has. The automatic open and closing is great, as damage to umbrellas usually occurs when fumbling with the locking mechanism too much. The skull handle looks really well crafted – I want it exactly as the preview images show, change nothing! It also lets me selectively show off my ultra-geekery. Of course, this thing is so gorgeous I couldn’t care less who likes it. The design quality overall just looks brilliant, so vibrant on the inner pattern. I can’t wait to get one the moment it comes out, damn the shipping costs to Australia! I think the design is absolutely fantastic! Using the Mad Hatters hat design was a great choice and definitely came out looking great. As for what I would like to see added or changed? I think the black on exterior looks great, but the interior pattern is absolutely beautiful and I think would look fantastic on the outside as well. That said, this is still an absolutely beautiful piece, you guys have absolutely nailed this one! 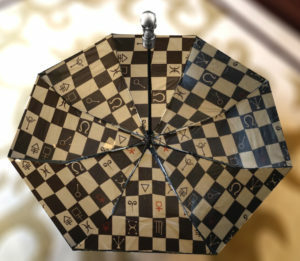 I love the umbrella with it’s symbols that match with Alice’s dresses and themes. I like the chessboard design also. The skull head handle tops it out. It would be fascinating to have the skull of a flamingo. Maybe I’m a bit too late but well… ?. I love the design of the umbrella. The skull head handle (for me) it’s a beautiful detail and the pattern is incredible too. I broke my old umbrella yesterday, so I’ll try to buy this one for Christmas.